The new Benjamin Franklin museum just off of 4th & Market in an area known as “Franklin Court” is under way. This will be Philadelphia’s newest exhibit about Ben Franklin and when completed, the new Benjamin Franklin Museum will be underground! The exterior or top of the Benjamin Franklin Museum. 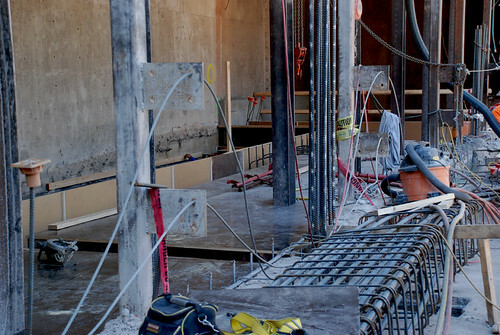 Ben Franklin Museum – new concrete slabs and support steel. Yes, an underground museum. And that’s all well and good but it posed some real challenges when it came time to do the expansion. You just can’t take a hundred and fifty year old building and slap a bunch of exhibits inside. You need a complete redesign to support the architect’s vision. And that exactly what they got. 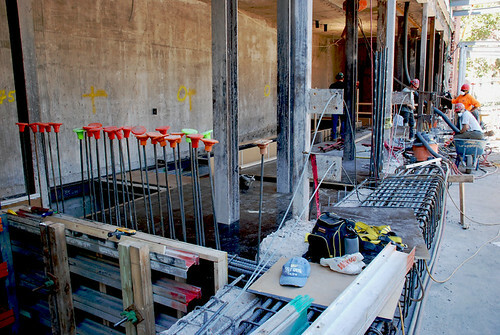 If ever you wanted to see what shoring actually does – this is the time. 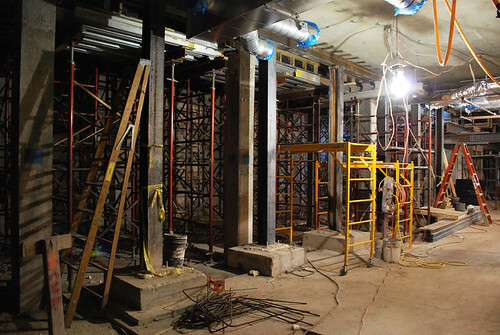 You can clearly see the work going on above the shoring and below the shoring. It always amazes me at the sheer weight that these post shores can hold when you take in consideration the cement and steel necessary to make a job like this happen. 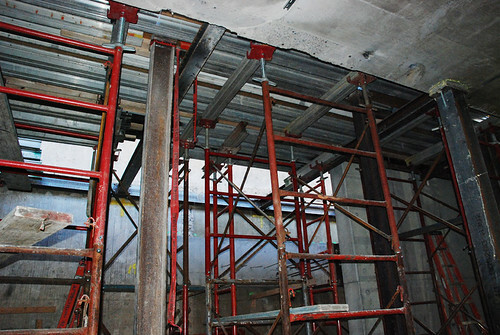 Beneath the concrete slabs you can see the shoring necessary to hold up the new steel and cement. This was an extensive demolition of an old structure to open up the building. 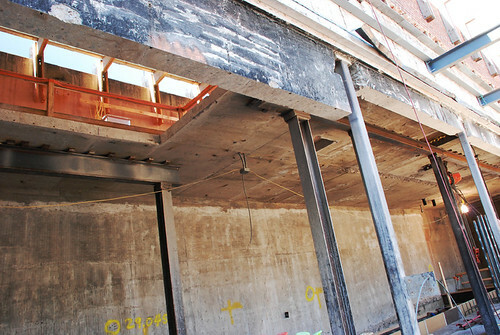 Walls had to be removed, ceilings had to be shored up so new steel and concrete could be poured to support the new additions. The view from below the concrete pour going on above in the first shots. Another view from the basement. 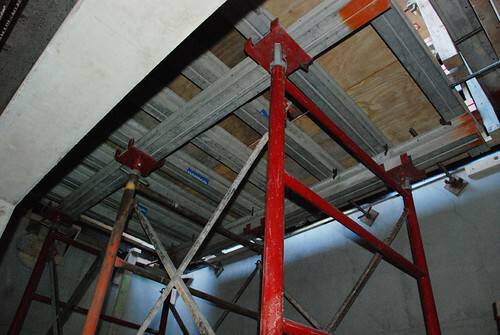 15” thick Concrete slabs were poured and giant concrete beams were brought in to help support the weight. That was probably the biggest challenge on the job. The steel was so long it took several cranes and expert crews to get them in through the alley and into place. 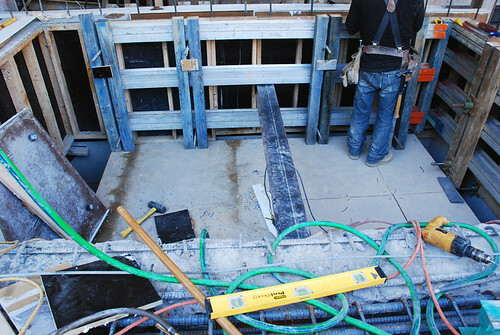 Superior Scaffold shoring guru, Bob Robinson, had to calculate all of the weight loads so the proper equipment could be utilized and the work done safely and up to code. What’s going on above the shoring. 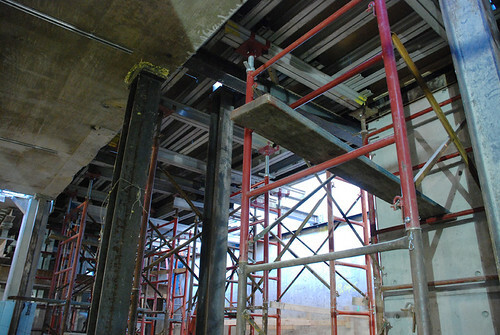 Some of the concrete beams in the new design were 36” wide X 42” deep and spanned 42 feet column-to-column! When it’s all done, the exhibits will be divided up into different rooms that reflect various aspects of his personality and his life. The museum will feature interactive displays exploring his life as a private citizen and statesman through individual, room-like installations. The library is intended to be the culminating experience. Other 21st century additions to the underground museum include interactive elements like touch screen kiosks, a computerized version of Franklin’s glass armonica a musical instrument employing glass and water to create sound, and two-minute animated vignettes designed to help visitors understand critical turning points in Franklin’s life. 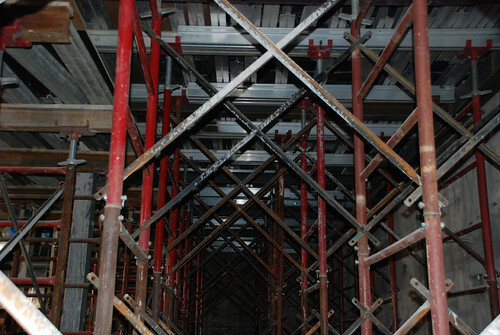 A clear view of the shoring necessary to support the work going on above. CBS local news coverage on the job. Click here for news on the construction job. 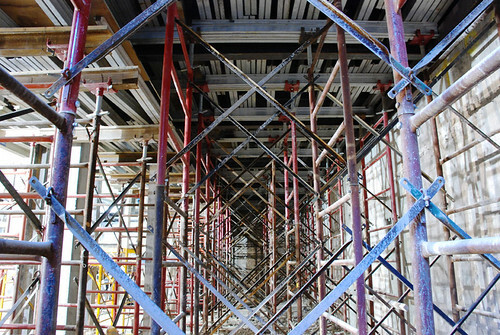 Posted on December 12, 2012, in News & Updates, Shoring and tagged architecture, ben franklin, Benjamin Franklin, building, construction, DC, DE, downtown, drawings, engineering, facebook, flickr, google, historic, history, Independence Hall, inspection, MD, New Jersey, PA, scaffold rental, scaffolding rental, shoring design, shoring philadelphia, shoring rental, superior scaffold, youtube. Bookmark the permalink. Leave a comment.